Our guide for taking the gigantic step into a tiny home. Tiny houses have attracted a lot of headlines recently, with enthusiasts touting the benefits of downsizing and living more sustainably. With property prices soaring and building costs rising, they’re becoming an increasingly attractive option. Is the move to a tiny house as simple as it sounds or are there hidden pitfalls? What defines a tiny house? Anything under 35m2 is considered tiny. That’s about the same footprint as a double garage or a typical hotel room. This bucks the trend of building bigger in New Zealand. Last year, the average size for a newly consented residential dwelling was 170m2 . This figure includes traditionally smaller apartments, units and townhouses. How do you fit a house in there? This 33m² tiny house contains a kitchen, bathroom and sitting area. Tiny houses often have ingenious storage solutions and foldout furniture to make spaces both multifunctional and spacious-feeling. The best designs consider the entire volume of the building, rather than just the floor space. This cutaway of a design from Tiny House Builders shows this in action. 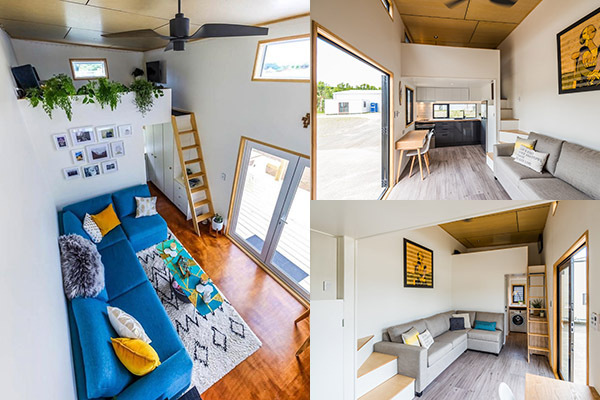 This tiny house is a mere 33m2, but contains a kitchen, bathroom and sitting area. Its two mezzanine floors allow for a queen bed and either a second sleeping area or an additional living area. The lifestyle requires a minimalist approach as there isn’t as much storage as a traditional house – you’ll have to get rid of anything that doesn’t spark joy. Why are some of them on wheels? If the structure is more than 10m2, it’s subject to the Building Code. 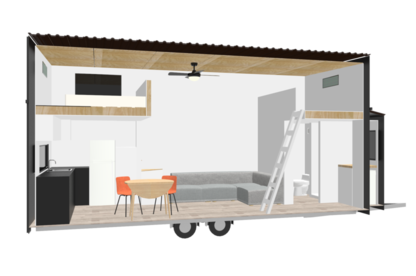 However, putting a tiny house on a trailer means it can be considered a vehicle rather than a building. The Building Act says it becomes a building when it’s “immovable” and “occupied by people on a permanent or long-term basis”. You’d think a house on wheels would avoid any red tape, but this isn’t always the case. As soon as it’s parked up with people living in it, your local council could consider it a dwelling. You need to check the rules first, especially if you’re planning on hooking it up to services. You’ve got one, where do you put it? Before you take the plunge, do your homework about where you’ll put your tiny house. The simplest approach is using family land, if they’ll have you. There are websites and Facebook pages advertising land for tiny houses but there aren’t many options in the main centres, so you might need to be prepared to move to the sticks. If the property doesn’t have any services then you’ll need to think how you’ll handle your power, water and waste needs. 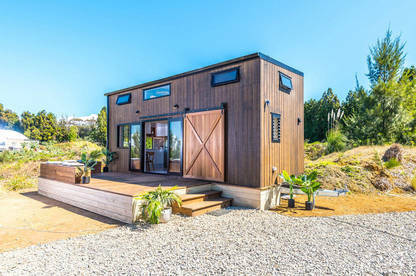 Donna Toner has ordered a tiny house, built by NZ Tiny Homes, and is looking for somewhere to set it up in Wellington. Q: What led you to your decision to take the leap towards owning a tiny house? A: After recently separating from my husband of 20 years, I found that even though our house sold for a great price, I still don’t have enough money to purchase another property in the region. I don’t earn enough to qualify for a mortgage, nor do I actually want one hanging over my head at my age (51). I decided a tiny home would give me affordable ongoing living expenses while leaving funds for travel and replacing my car. To begin with, it was my only option. However, now I have started the build process, I’m super excited and looking forward to the change of lifestyle. Q: Can you tell me about any stumbling blocks you have hit along the way? The council is the biggest one really. Every person tells you a different set of rules. There seems to be nothing in writing [the council] can give me to define what I need to know. Residential land has so many restrictions, yet these are what the council can’t seem to agree on. My understanding is as long as I stay within trailer regulations, can move my unit when required (without the use of tools or dismantling anything) and don’t hook into any services, it’ll be classed as a caravan rather than a dwelling. Unless you can read all the legal guff and make sense of it, it’s hard to understand. Q: Do you have some land lined up? A: At this stage I don’t have land and I can’t find any that’s suitable. I need something closer to work as opposed to rural. I can’t afford to travel too far for work. Q: What sort of tiny house are you building? A: It’s one bedroom with a full-size bathroom/laundry and an open-plan kitchen/lounge. There’s loads of storage in my bathroom with a 900x900mm shower, washer/dryer combo and full composting toilet. My waste and fresh water are stored within the trailer space. I’m running gas to heat water and will have a 3.4kw solar package so I can be completely off the grid. I’ll be running it that way until I find a piece of land to purchase, at which point I’ll hook into services (changing to a normal toilet) and install a deck. Q: Have you had to make a big clear-out of your worldly possessions in preparation for the move? It has been a huge change in mindset – sacrifices seemed to be coming at me thick and fast. I got brutal and had to decide how my life would be without them. In the end, I decided they were just things that I could discard without any dramatic impact on my day-to-day life. I’m sure I could downsize further as there is a slight issue with shoes – I have too many and they’re the one thing I find difficult to part with. Q: Why did you choose to go down this path, rather than opting for a caravan or motor home? It gives you that feeling of space you get with a house, but with the mobility of a caravan. Caravans to me are cramped and you have to move things around to create spaces (converting the living area to a bedroom). I wanted the option to make it more permanent by plumbing into services and adding on in the future. I can also use it as an Airbnb later if I move back into a “normal” house. First-home buyers are paying nearly $700k, on average, in Auckland right now. If you have [land], you can use it as security to fund your build. You still might get a loan from a bank or other lender without land, but it will be unsecured and interest will be much higher. The 20% deposit required by banks for a home loan would more than cover the cost of building your own tiny home. You wouldn’t have a mortgage, but you wouldn’t own any land either. We asked four banks about their tiny house lending policies. They tended to assess cases on an individual basis, but the key thing was owning land to begin with. If you have that, you can use it as security to fund your build. You still might get a loan from a bank or other lender without land, but it will be unsecured and interest will be much higher than current home loan rates. “There are three key criteria a tiny house must meet to be eligible for home loan lending. Firstly, it must be permanently attached to the land on which it is placed. This is a condition of providing residential security on a mortgage. “Secondly, the borrower must either own the land outright (either personally or through a family trust), or secure a freehold lease in perpetuity. We’re unable to lend on dwellings placed on land that is public or temporarily leased from another owner. “Thirdly, while we recognise the evolving demands of housing types across the community, some very small dwellings may be less suitable for home loan lending, due to current lower demand for such dwellings. “In some circumstances, if a borrower does not meet the above criteria, they may also be eligible for an unsecured personal loan to finance the property. “We would consider lending for a tiny house but that lending would be provided against land or another property which we would have security over. If the land was freehold title we could lend up to 80% of LVR in first instance. “Many tiny houses are on wheels or a trailer and therefore considered a chattel, which we wouldn’t fund with home lending. “If a borrower wanted to place a tiny house on land owned by their parents, then their parents would need to be part of the borrowing arrangement given that it effects their own property and likely that this would be used as security. “If the building was affixed to a parent’s land, then ownership would lie with parent unless title was changed to tenants in common in equal/unequal share. “Kiwibank does not accept tiny houses as security. We will lend people money to buy/construct them though, the two things are separate. A top-notch tiny home could cost you well into the six-figure mark. The featured design from Tiny House Builders might run from $127,000 to $155,000, depending on the fit-out. There are cheaper options, or you could opt for a second-hand home, but you might need a bit of elbow grease or extra dosh to bring it up to your standards. Or you could build one yourself. There are question marks raised around whether they’re a depreciating asset and, without attached land, they probably are. Your cheaper living costs can offset this, but you’ll likely be better off seeing this as a new way of living rather than as an investment.